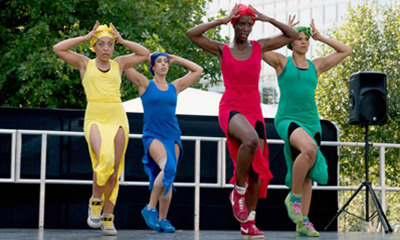 IdeasTap and Team London Bridge are commissioning three outdoor dance pieces themed around the five human senses to be performed as part of London Bridge Live Arts festival, 25 to 27 September 2014. Each piece will showcase emerging London dance talent as part of a programme of performing arts. Team London Bridge will give each group £500 to £1,000 to produce their dance piece. Dance commissions must relate to the theme, either directly or indirectly. Team London Bridge is keen to receive proposals that that compliment the sensory and interactive nature of this year’s festival. London Bridge Live Arts is now in its third year. This year, the programme includes a range of performances that reflect its venue, the Quadrangle at King’s College London Guy’s Campus, and the wider community’s historic contributions to biomedical science. Pieces will be selected by a panel of team members from IdeasTap, Team London Bridge and Fantasy High Street, who are producing this year’s festival. Applicants will be selected based on technical skill, creativity and consideration of the festival’s and location. Sites will vary in size. Team London Bridge encourages dance genres that are accessible to the greater public, and of interest to residents, local employees, and visitors. Successful applications will be innovative and engaging. The judges want to see work that is vibrant and eye-catching and connects with audiences on different levels. When responding to this brief, each group is expected to submit an expression of interest. Commissions will range from £500 to £1,000 and each expression of interest must include a detailed budget breakdown as well as a description of the piece. Submissions must also include at least one group performance video. This video does not need to be of an extremely high professional quality or of the specific piece being submitted. It simply needs to reflect the style and makeup of each group. This brief closes on Monday 18 August 2014 at 5pm BST and is open to IdeasTap members aged 18 and over. Late entries will not be accepted under any circumstances, including technical issues – so make sure you don’t leave your application to the last minute.